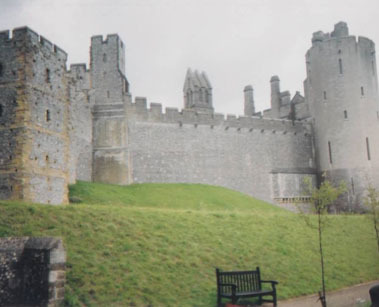 Arundel Castle is in West Sussex, high on a hill. 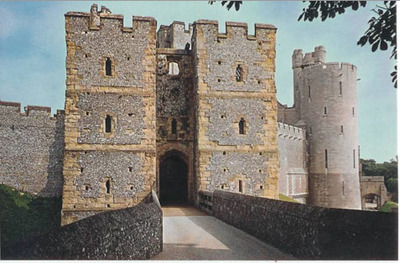 It was founded by Earl of Arundel, Roger de Montgomery on Christmas day of 1067. Montgomery was one of William the conqueror's most loyal barons at the time. He built the castle to protect the town from attacks. This was an excellent place to build the castle because it had so many natural defences. The castle has many natural defences. On the east side it has a cliff with an eighty foot drop, and in the south was the River Arun. It also had a huge open area, which meant that if anyone were too attack, they would be extremely vulnerable to arrows, catapults, or later on in the seventeenth century, cannons. The west was the weakest point of defence and was the side that any army would attack from; this is why it was the most armed section of the castle. In the north, there is a great view of fields that goes on for miles, which would allow guards to see their enemies very early on and be able to prepare properly. The round tower is recent and was not put up until the nineteenth century. Cylinder towers were invented in the late thirteenth century because arrows and later cannons would ricochet off, where as as rectangular tower will be damaged more severely. Located on the north side of the castle is the fourteenth century Barbican. It had two portcullis's to trap and kill the enemy. The Barbican was very narrow, which made it difficult to attack your opponent or get more than a few people through at a time. Although it made it more difficult for the enemy, it also made it more difficult for the Arundel soldiers as well. Outside the front and back of the building, there are two Brettrice doors from which guards could throw stones at the enemy or pour scolding hot water and boiling oil. The Keep is the shape of an arena where most of the people retreated in the attack by Stephen while Queen Matilda was there. This was often where the members of the castle would hide if attacked. This is where they kept their food stock and other supplies when under attack, so they didn't run out during a siege. There is a flight of narrow steps from the well where there was a guard room that was purposefully kept cold so the guards would not fall asleep on watch. The guards had to be by their posts, which meant they couldn't leave the building to go to church. Instead, above them was a small chapel called St Martin's. The guards would often come into the chapel not only to worship, but also to get warm as there was a fire in the room. Also in the room was a sally port. This would have been used to send spies down to spy on their enemy with them knowing. This is a possible escape route that Queen Matilda may have taken to flee. There was once an outside spiral staircase that lead up to the lookout tower, but it collapsed and instead of replacing the old one, they built a new wooden one that was inside the chapel itself. On the top floor there is a Garde Robe. This is what was used in the twelfth century as a toilet. It was basically a big hole at the top of the tower. This could have been a problem to those with poor balance. Apart from the Keep, Matilda's room was the safest place in the castle. It was well protected because she could easily reach the Keep and there was a passage to the Barbican underneath. Her room was dim, with only a few torches on the flint-stone walls, the floor was made of wood and there would have been very small windows. There would have been a fire place and it would have been likely that she would have had tapestries around it, so it would save the heat and keep the room warm. Most of the castle that is left today is not the original because it has been improved and repaired so many times by different people from different centuries, including the the Normans, Tudors, and Victorians. Between 1870 and 1890 it was almost completely rebuilt by the Victorians with a Gothic style design. We are in fact still making restorations to it today, but we are using the original materials used. Out of the original castle, only the kitchen and a part of the curtain wall remain. There was a lot of restoration in the nineteenth century by the Victorians. A fair amount of work was needed on the castle, but unlike now, they didn't use the original materials, but instead used their own and rebuilt the castle in their own style, which makes more than half the castle Victorian. Arundel Castle is open to the public between the 31st March and 4th November. Adult tickets cost between £8-£17, students & seniors are £8-£14.50, and children's tickets are £8. You are free to walk around the castle by yourself, or you can book a guided tour of the castle and garden by calling 01903 882173.